Enshrined in publicity materials and regurgitated ad infinitum by the music press, by this point in time it’s common knowledge that async is Ryuichi Sakamoto’s first solo album since recovering from throat cancer. Indeed, Sakamoto’s illness and recovery are now almost as ubiquitously appreciated as the depth and breadth of talent that he has – between Yellow Magic Orchestra, his work with Alva Noto, and that which he has created alone – consistently demonstrated and gifted to us as one of Japan’s greatest contemporary musicians and composers over the last 39 years. On the one hand, there’s a danger to this – a sense that, regardless of intention, the 14 pieces of music that make up async will be reorganised and reinterpreted, crowbarred to fit this narrative – that this will become Sakamoto’s “recovery album.” On the other, of course, as a reading this is as valid and vital as any other: yes, Sakamoto has described async as a soundtrack for a Tarkvosky film that does not exist – but one need not dive too far into the Russian director’s filmography to appreciate how much those films are informed by the themes of mortality, of shifting personal history, and of the duality of human nature (although it is strongly recommended that you do). With that in mind, async, in a sense, is emblematic of these ideas – the product of their evolutionary comingling. The necessary impossibility of separating the artist’s brief departure from recording and performance from the 61 minutes of async – for us as listeners and likely for Sakamoto himself, too – offers us one way of listening to and interpreting his return through biographical context; the Tarkovskian reference point and the images that conjures when paired with the album (of wind through empty buildings, negative film prints of rippling water, darkling mirrors) provides another route – more escapist in nature, but no less vivid or authentic. Yet, it is when the two are combined, or when the membrane of their differences is at its most permeable so as to seem non-existent, that the scope and vision of this record is most apparent. 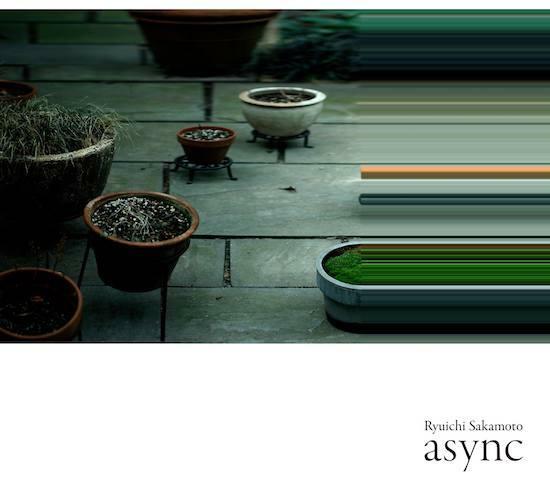 Willfully or otherwise, it seems that Ryuichi Sakamoto has hit the temporal sweet spot with the release of async. Not only is the music and culture of Japan at peak vogue right now – from the sonic tapestries of Visible Cloaks’ Reassemblage to the seemingly unstoppable spread of Tokyo’s sartorial aesthetics and the fact that every other person you know seems to be going there right now or have just returned – but also it seems that soundtracks as an art form have been warmly welcomed from the sonic periphery. Perhaps most recently with thanks to the likes of Mica Levi for Under The Skin and Jackie, and Kyle Dixon and Michael Stein for the barely known Stranger Things – but also over the last few years to the tireless and pioneering work of people like Clint Mansell and Cliff Martinez, their appreciation is more widespread than ever. Intended or otherwise, Sakamoto has a rich vein of valuable zeitgeist to mine; even the practice of scoring films that do not themselves exist has become increasingly popular of late. Yet, with all those prominent influences and contemporaries at the fore, a veritable embarrassment of riches, the music of async, the visual world it builds through its sonic textures, and perhaps even Sakamoto himself, has more in common with the work of an artist whose name is much more rarely found on the tip of anyone's tongue. Indeed, the most accurate comparisons are to be drawn with the South Carolina-born writer, director, composer and actor Shane Carruth whose films Primer and Upstream Color – which were both written, directed, scored and starring Carruth himself – are works not only of staggering aural and visual beauty, but also sprawling meditations on the volatility, impenetrability and dreadful wonder of the human condition. In many ways Upstream Color ought to have been a turning point in contemporary filmmaking – or at least the way in which modern cinema engages the senses. Carruth's score clatters and swells in equal measure, invoking both the celestial and the physical as it does so, blurring and ofttimes erasing the lines between them: it is simultaneously a prescriptive reflection of the events on screen and an ambiguous effectors in and of itself – warping, perhaps even steering, interpretation. Compare this to the press material for async, which tells us that the album "plays with ideas of a-synchronism, prime numbers, chaos, quantum physics and the blurred lines of life and artificiality/noise and music." It informs us, too, that Sakamoto "took inspiration from everyday objects, sculpture, and nature, and composed and arranged the sounds/music that he most wanted to listen to. Paying close attention to the essence of each track and carefully balancing the sounds with a less-is-more perspective, what remains are singular expressions of Sakamoto’s current mindset, and one of his most personal albums." Based upon these descriptions it seems that Sakamoto and Carruth are not only creative bedfellows in possession of the same tools and channels, but also searching for something similar – a notion of order in chaos and of chaos in order. It is not enough for either to ask introverted questions like "Why am I here?" or "Who am I?" – nor even the broader "What is our collective purpose?" – rather both seek to make connections with the physical and metaphysical worlds around them; both are looking for dialogue rather than answers. Musically, async weaves together intangible synthetic panes with the more earthly, percussive tones of the piano on tracks like 'zure', and on 'walker', natural noises – the call of cicadas and what might be either the sound of footsteps on gravel or heavily frosted grass – are juxtaposed in call and response with gentle swells and vibrations. It is these contradictions, appearing track after track, and which after all are only contradictions on paper, that make clearest the album's concern with duality: the way in which Sakamoto imbued those everyday objects with further significance, or the quantum mathematics hidden behind the manifestation of each sound – these are all ways of approaching the idea that any one thing is more than just that one thing. That the world as we know it – and as we don't – is constantly, with a sense of barely-noticeable fluidly, fluctuating between states. It's on 'life, life', however, where this notion is crystallised most completely. It's also in this completeness where async flounders briefly. A combination of traditional Japanese instrumentation (the shō), pizzicato strings, and synthetic textures 'life, life' is wave-like as a piece of music – fearfully serene. But both serenity and brooding apprehension are deflated by a reading of a poem by the Russian poet Arseny Tarkovsky – Andrei's father. "To one side from ourselves, to one side from the world / Wave follows wave to break on the shore, / On each wave is a star, a person, a bird, / Dreams, reality, death - on wave after wave." Intoned with a masterful sense of monotony by David Sylvian, 'And this I dreamt, and this I dream' is as much a fitting cornerstone for this album as anything the poet's son might have conjured on film, encapsulating as it does the wafer-thin divides between life and death, waking and dreaming. Yet, beautiful as it is as a piece of writing, its razor-sharp observation is at odds with the sense of vaporous ambiguity created by Sakamoto across the rest of async. The organ swell of 'andata', the rainfall of 'honj' and even the arpeggiated synth of 'stakra', escalating into empty space and reluctantly receding, are perfect conceptual facilitators for Sakamoto's musing on the fragility and flexibility of human life. "Life is a wonder of wonders, and to wonder / I dedicate myself, on my knees, like an / orphan, / Alone - among mirrors - fenced in by reflections: / Cities and seas, iridescent, intensified," the poem reads. But we need neither Arseny Tarkovsky nor David Sylvian to tell us that – Sakamoto has been whispering in our ear, communicating it all along. To reach the end of async, then, is not to finish an up-to-date biography of Ryuichi Sakamoto, nor simply a chapter on his illness and recovery. Rather, though perhaps understandably inextricable from the context of that recent portion of his life, async is a testament to a lifelong preoccupation with life itself – to examination beyond introspection, and to a world not so much beyond our own but ever so slightly out of phase.